Welcome to February. Can you believe it? 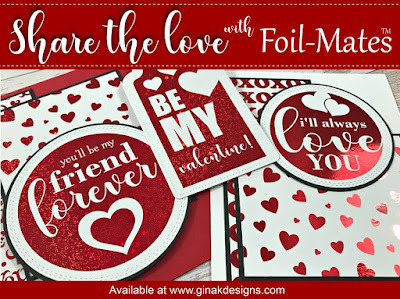 Since this is the month for sweethearts, how about a blog hop using the new Foil-Mates and Fancy Foils from Gina K. Designs. The team is sharing cards from the newest Foil-Mates release and we hope you will hop along with us today. We have a $50.00 Gina K. Designs gift card up for grabs...so be sure to leave a comment on each blog! To see who won, check the Big News Forum at StampTV a few days after the hop. First up is my card using a technique I saw Jennifer McGuire use and I had to try it! as you can see, the sparkle still shines through. Even though this is only a one day hop, tomorrow I'll be sharing two more cards using Foil-Mates and Fancy Foils. I just couldn't stop using these shiny Valentine products! Come on back and take a look if you have time! oooo that first one rocks! Love the colors, well everything about it! Great cards, love the rainbow. Thank you for your inspiration. Gorgeous cards! I love the Copic colored one! Beautiful cards. I just recently started using alcohol ink on silver foil and love it. Love, love, love these cards, they are both stunning!!! The effect with the Copics on the foiled heart is fabulous, and the pink is so sweet and pretty. Thanks for the great inspiration! Love these cards and the three colored heart is so neat. I really love the way you used different colors on the heart. Great cards! Your cards are so beautiful! Love them both!! Beautiful shiny cards. I really like the turquoise and green heart. Oh!!! The Turquoise Sea card is fabulous! I love your cards. The turquoise card could be used anytime. Very pretty! Love the one you colored. Love the cards!!! Thanks for sharing. love the cards, especially the Turquoise sea one. i haven't tried Jen's technique yet but sure looks lovely here. Another stunning pink card. But your turquoise card delivers a big surprise! What a nice surprise. Beautiful cards! Love the bubblegum foil! Lovely cards, especially love your 2nd one! Beautiful cards - love the colors on the Heart! Thanks for sharing! Great cards. Especially love the heart done in non traditional colors. Beautiful cards! Love the colors on the Heart! Thanks for sharing! Love the colors! I love seeing the different shades available. Thanks for sharing! Wow, these are gorgeous. Love how you colored the heart on the first card. WOW! These are great. I will have to try the copic coloring. Your card is stunning. The colors you used were perfect. I love these foilmates. They are so pretty without the mess. Love them all. I love you pink card that to die for! such fun the way you used the foil, but added the copic colors to make it truly unique. 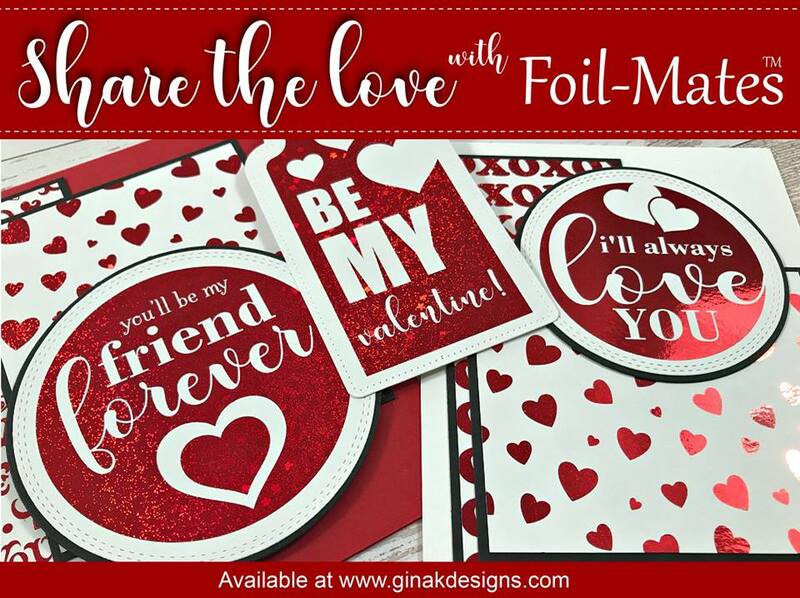 Fabulous foiling designs on all of the cards you made. I especially like the first one which is not quite in as traditional colors. That is cool! Beautiful Susie! I love the colors you chose for the first one. Love everything about the beautiful pink card. Beautiful cards.. I really love the colors of the first one..amazing!!! This is so adorable! Love the heart and little twine bow! Thanks for the great ideas, especially in the non Valentine's Day colors! Wow....the colored foil came out so pretty! Love that nee bubblegum pink too! Delicious! Those are beautiful. I love the colored heart, I never thought of doing that and I love the results. The cards are so pretty! I'll have to figure out how to do the coloring; gives more options. Just amazing cards, foil, stamps, and designs. Great tips. I'll have to try the Copics on foil too. Looks fun. Just lovely. I love the colors! Really great cards. Your cards are beautiful! Your first one is my favorite (probably because that has to be my favorite color combo). That technique is so fun. Can't wait to try it. 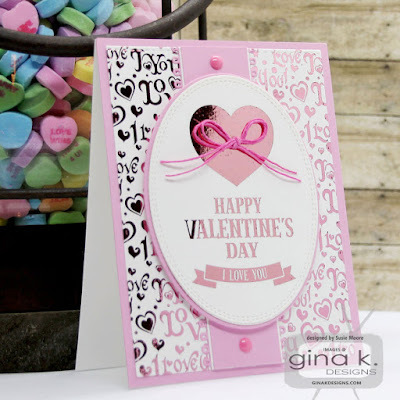 I enjoyed seeing other color combinations used for Valentine cards. Like the yellow, green and blue one. Cool idea, will have to do similar. Beautiful cards, Susie! I really love your second card! I love your samples, they are both just beautiful. I love the mix of colors on the first sample. That second sample is like over the top perfect! Grateful Meats background, I love everything about it! Sweet cards. I like the layers on the first one. Susie, your cards are beautiful!!! I love the first one with the heart! Love the turquoise sea card it is so different. Beautiful cards! I really love them! Lovely cards and the added copic coloring to the first one is gorgeous. Such great cards! 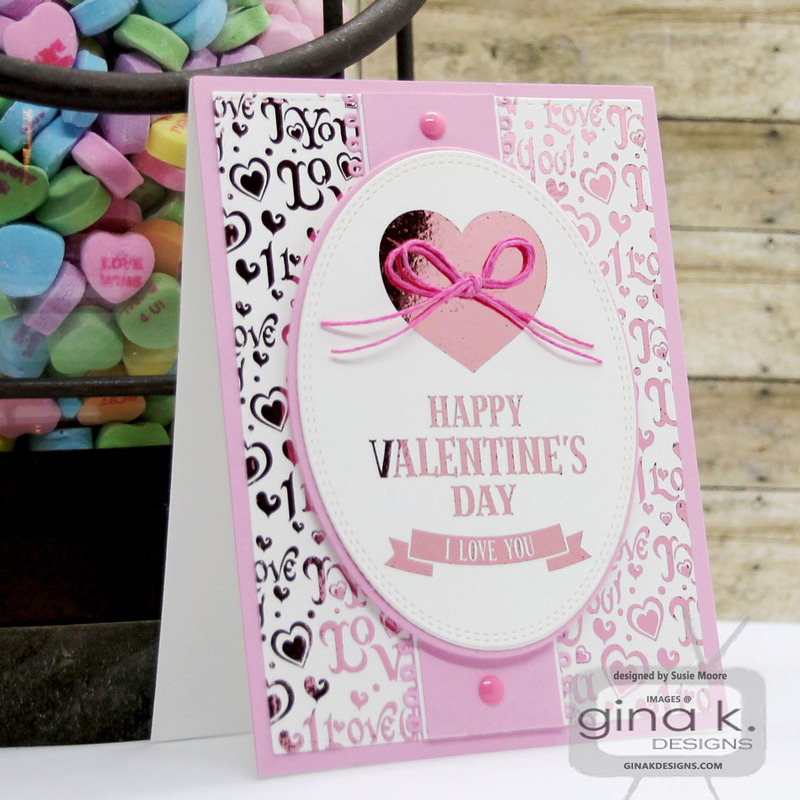 Love the colors in the first card and that pink is a stunner!!!! I really really like how you colored that heart with the Copics! Both are beautiful, but I love your multi-colored heart! Beautiful cards! Can't wait until my new foil mates come so I can get started on foiling! Love your cards love the colors very nice. The colors on the first card are amazing! Both cards are beautiful though. I love the card you made with the Copics - it's stunning! Gorgeous cards! I like the way you colored the background of the first one. And, the second one is just so pretty. Two beautiful cards. Love the non traditional colors used on one of your cards! Wonderful cards! I love the non-traditional colours for a love card in the first one! Beautiful cards, but really like the turquoise sea card!! I absolutely love the color combination of your first card! So pretty! Oh my! those copics with the foil are just fabulous! Oh, so well done. I admit, I'm a little red/pink-ed out at the moment, so that turquoise/green/yellow one was just the palate cleanser I needed. And every time I see the background foil you used on that one, I fall more in love with it. So sophisticated and classy. Thanks for showing us your beautiful cards! What a fabulous post with beautiful work! I love the non-traditional colors in the first card! So pretty and shiny. Great cards - Love them both. Very elegant. 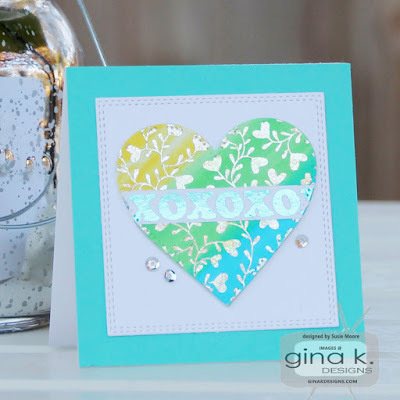 Love that you chose a non traditional color palette for the turquoise, green and yellow card! Gorgeous foiled cards! Love the Turquoise one!! Both of your cards are gorgeous but the first one, with the so wonderful heart, has my little preference.